"These are a delicious substitute for pickles on a relish tray. They also work well added to a lettuce salad. These can also be packed into sterile containers and sealed for later use." In a large saucepan, mix distilled white vinegar, white sugar, vegetable oil and water. Bring to a boil. Remove from heat and stir in salt, garlic and anchovy filets. Place red bell peppers in a large bowl. Cover with the vinegar mixture. Cover and chill in the refrigerator 8 hours, or overnight, before serving. See how incredibly easy it is to make these tasty blistered peppers. This made a nice compliment to my 'non-relish' relish tray this Christmas. I reduced this recipe down to using only 2 red peppers. It came out beautifully! 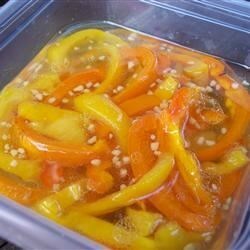 I love the taste of these peppers, and will be sure to make them again very soon! Soooooooooo easy - I too omitted the anchovies. Can't wait to use this during the summer when peppers are so plentiful!!! We love this with toasted bagels and cream cheese. Made this today because I had a lot of red peppers. It turned out great and the whole family loves it. To my amazement they ate almost the whole jar.